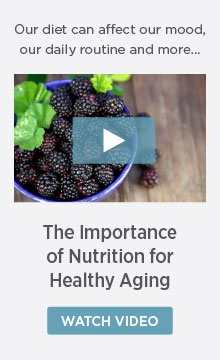 Research shows that eating nutritious foods can help lead to longer, healthier living. Smart food choices offer many benefits to aging adults, which is why we always strive to incorporate local, fresh, and sustainable ingredients into our meals. Including a broad spectrum of fruits, vegetables, whole grains and lean proteins, while avoiding high salt and processed ingredients helps ensure that residents are receiving the nutrition they need. Our Food for Life™ program provides residents living at The Goodman Group communities with options following the senior nutrition philosophy espoused by John B. Goodman. Food for Life™ helps enable residents to achieve an optimum level of overall wellbeing.